My first half term at Michaela Community School has come to an end. I have really enjoyed it but it has also been very difficult. It has been difficult in terms of the mindset change I have had to make, as a teacher, and also in my teaching two subjects, including one which I had never taught before, Science (alongside teaching Maths). I joined Michaela because I wanted to learn about curriculum design, as well as developing my pedagogy in terms of subject knowledge and sequencing of problem types. I am going to share the problem types that I have come up with (through discussing it all with the team – Bodil and Dani) whilst spending Saturday planning for next half term. I am going to start with solving one step equations and two step equations. First, an important point: I was initially struggling to understand whether the following problem types are three step or two step equations. However, following Kris helping me to realise that they are two step equations – because we rearrange over the equal signs twice to achieve the numerical value of the unknown – I’d manage to resolve this. And so, let’s get cracking. 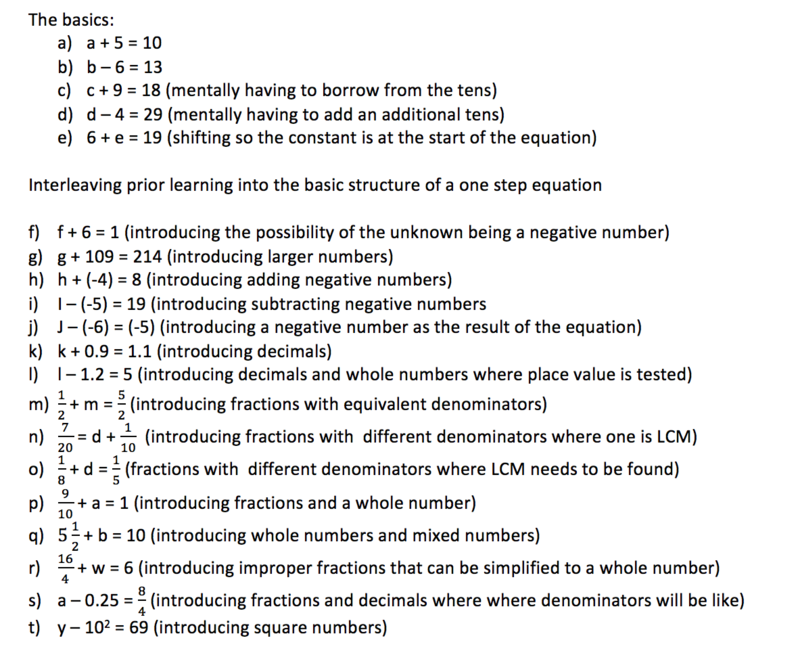 I have found that, in order to induce our children to be more successful academically, in exams, and also in developing greater interconnections between different topics such as solving one step equations and fractions, we need to show them a variety of problem types. I would, formerly, teach three or four very similar problem types such as below. Now, after Craig Jeavons’ and Bruno Reddy’s talk on Shanghai pedagogy I have branched out to teach a variety of different problem types, but all with the same thread of thought. The procedure of solving one step and two step equations is made clearly visible to the children, through the carefully selected and crafted worked examples used. The children, following this, then try a few problems on their mini whiteboards, in order for me to check their understanding. Here, I ask more questions to ensure that after each and every question more and more children are getting the correct solution. I am, effectively, trying to close the gap. 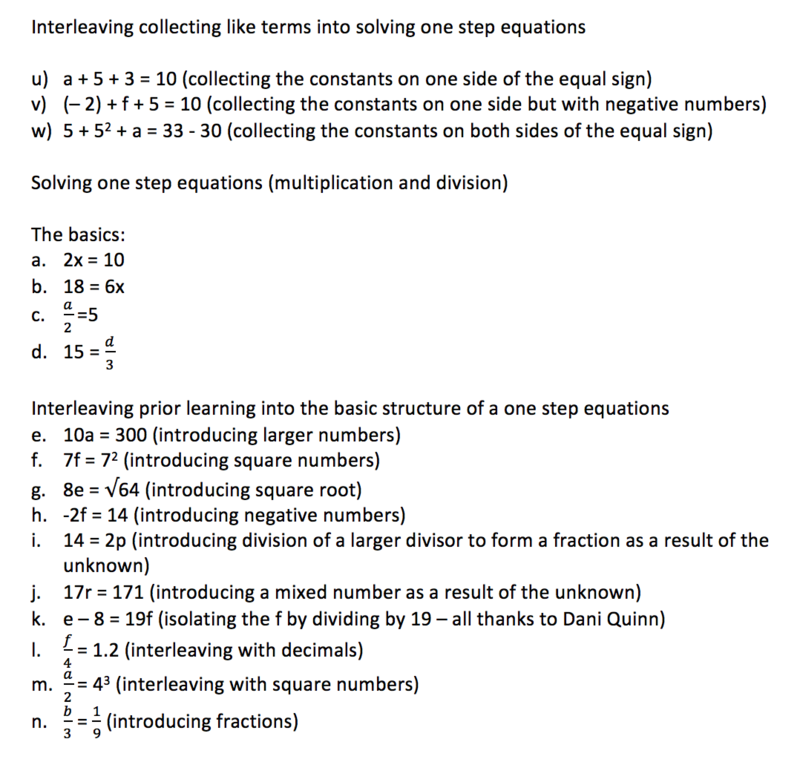 Through this, I am sure that the children will find the practise of such questions listed below more meaningful, because they are applying their knowledge of the problem and procedure to questions that have a different level of surface knowledge but the depth behind solving the equation is similar in all the problem types shown above. This is what I have learnt in making these nuanced problem types on Saturday afternoon. I hope this has been useful. I have attached a lesson plan of how I structure my teaching for a lesson. Enjoy! Usually I would blog in detail about the wonderful workshops I had attended and what I had learnt from each one. This post does not do that, and instead it highlights something different; something interesting. Every maths teacher should attend Mathsconf6. Mark McCourt. What Mark has achieved by establishing a National Mathematics conference is incredibly powerful. It is, in short, a movement. Mark and his team at La Salle have effectively united thousands of maths teachers and educators in one location on a Saturday to do great things. Very experienced and intelligent teachers hold several workshops to share good practice from the likes of Bruno Reddy, Craig Barton, Kris Boulton, Jo Morgan, Amir to name just a few. Here, various topics are discussed such as the new AQA specification and its implications, diagnostic questioning and the use of Multiple-choice questions, the stories of Mathematics, Singaporean Teaching and Bar Modelling etc. I believe that Mathsconf can be said to be a movement because its teachers are being empowered by learning about the many changes to come within education, but also by learning what has been working effectively in the past. Teachers are growing and developing from each other. There is a space for this to happen. Teachers from all around the country who have different amounts of experience in the classroom, who have entered teaching via different ITT routes, are getting together and we are talking: we are learning. I attended the first maths conference as an unqualified Teach First participant and it revolutionised my teaching practice. I have now attended all five conferences held so far. My pedagogy is developing because of the workshops I attended and everything I had learnt was smoothly applied in the classroom. For example, I attended a workshop by Robert Wilne who made it increasingly aware to me that my teaching was not enabling my pupils to develop the procedural fluency mathematically to access some of the nuanced problem types to come in AQA’s new specification. His workshop taught me that intelligent lesson planning was composed of a selection of carefully crafted and logically sequenced worked examples. At Bruno Reddy’s workshop, I learnt that I needed to ensure that I taught minimally different concepts such as area and perimeter far apart. At Kris Boulton’s workshop, I learnt that Pythagoras had learnt a lot from the mathematician Talmus – who knew? Through these regular Maths conferences, new Hubs have started such as Lime Oldham run by the brilliant duo Lindsey Bennett and Richard Deakin. This, in turn, catalysed Lime Brent to come into force by Bodil Isaksen and Lime North Yorkshire by Neil Turner. A Twitter network of teachers has blossomed, with a significant amount of credit to be given to Old Andrew for his blogs and tweeting. Teachers all around the country are able to share informative sound bites from these events, further engendering communication amongst teachers throughout the country. Did I mention that I’d gained my current reaching post through Twitter!?! I.e., only because I met Bodil Isaksen at mathsconf2 – the social network is so very empowering. I look back at my ITT with such regret because pedagogy was not at the centre of my teacher training. Whereas pedagogy is at the forefront at each workshop held at mathsconf. At ITT, the majority of my time was spent talking about behaviour management, and asking unqualified teachers to discuss how to plan a lesson with no knowledge of how to. It did not teach me how to use bar models as a pictoral aid to teach ratio or solving one and two step equations. My ITT did not teach me how to sequence the teaching of different topics such as teaching fractional indices before teaching surds. What on earth was the point of my ITT? What I have learnt continues to contribute to my becoming an impactful teacher; from the workshops I attended at Mathsconf as well as my efforts to develop independently my teaching through reading a selection of blogs and books. This has also allowed many teachers around the country to develop and grow. I feel empowered after attending a La Salle Education conference. Such mathconfs are practically essential even more so at at a time where so much is changing within the field of education. There is so much expertise in one room that the possibilities are endless. Even more so at a time where so much is changing within the field of Education. There is so much talk going on about Mathematics Mastery, Shanghai, Maths Hubs, AQA New Specification and teachers all around the country are trying to work out what this all means for them in the classroom. Mark has established a space for teachers to become well-informed: it is a space where different thoughts, opinions and ideologies regarding education can be discussed. Lastly, I believe it has provided me with well informed opinions about the current state of education. I do think that the current quality of ITT is shambolic. I do think that there is a huge disparity in the quality of teaching delivered in different parts of the country, as a result of ITT. I do think teachers are not aware of the complexities of pedagogy in terms of the sequencing in teaching of different topics after each other, or the CPA framework in teaching concepts such as ratio. Mathsconf is providing some support in overcoming such problems. More importantly, one cannot necessarily know of such problems without breaking out of one’s bubble and see what is happening on Saturday 5th March in Peterborough. For this reason I think it is essential for more maths teachers to attend conferences like mathsconf. We are constantly learning. We need to continue developing because changes are coming and they will continue to come. To allow our pupils to be successful we need to be informed of these changes. We need to adapt to these changes not for their sake but because these changes will impact our pupils. So, I’ll see you all on Saturday 5th March!